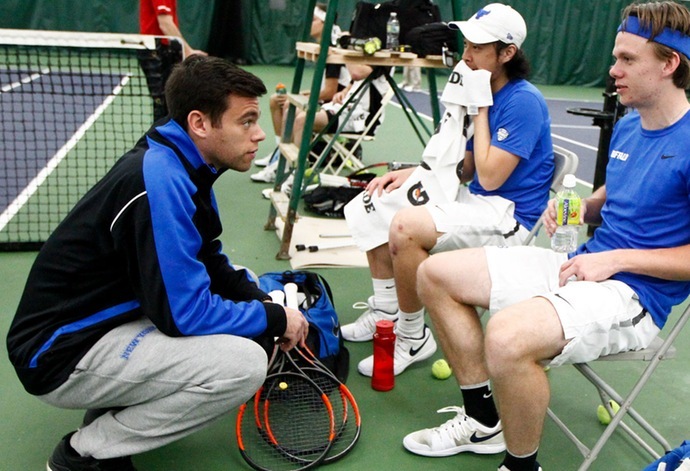 BUFFALO, N.Y. -- Head men's tennis coach Lee Nickell has announced the addition of former UB men's tennis player Tony Miller as assistant coach to his staff. Miller replaces George Tibil, who served as assistant for the Bulls last season. Miller played for the Bulls for three seasons and most recently served as a volunteer assistant coach with the Bulls this past year. He holds the distinction of being the only UB men's tennis player to be a part of both NCAA Tournament teams (2015 & 2017). "I am excited to announce Tony Miller as our new assistant coach," said Nickell. "Over the course of his playing career, Tony captained two teams to the NCAA tournament along with contributing in both singles and doubles. He grew into a leadership role that really contributed to the overall success of the program, and helped create a culture that led us to new heights. He was an obvious choice to replace George, and I know the team is just as excited as I am to have him as a full time coach." During his senior season, Miller excelled in doubles with Ethan Nittolo as the pair went 12-7 at third doubles. Miller also won his lone singles match of the year, scoring a 7-5, 6-1 win against Quinnipiac at sixth singles. He was named an Academic All-MAC selection following his senior year. "I couldn't be more excited to be back with the Bulls," said Miller. "The University at Buffalo and the Western New York community is very special to me and my family and I am grateful for this opportunity. Lee Nickell has one of the best minds in all of college tennis and what he's done for this program is quite remarkable. I look forward to learning from Lee, continuing to win championships, all while building this program into a national powerhouse. I'd like to thank Lee Nickell, Kathy Twist, Mark Alnutt and all involved in making this dream a reality. It's an exciting time for UB Athletics and can't wait to get on court with the team." Miller graduated from the University at Buffalo in 2017 with a degree in Communications.